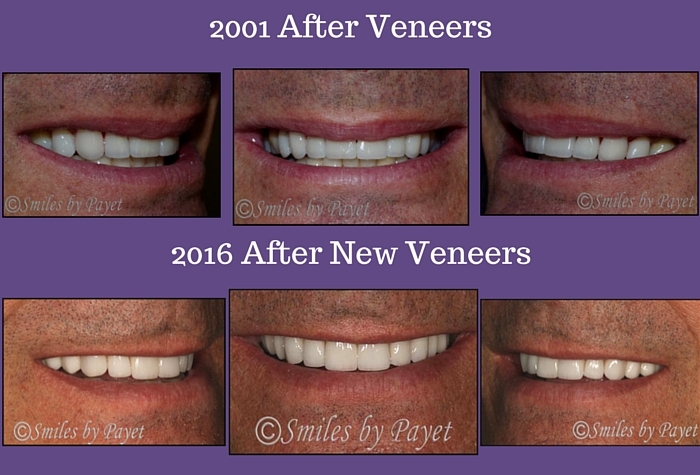 What can (and can’t) you change about my smile with veneers? When are veneers better than braces? How long do veneers last and what happens when they need replacing? Please forgive the varying levels of photography you see through this article; the first photos were originally slide film that were scanned from negatives, then they move through a series of progressively better cameras and a progressively improving photographer (me). 🙂 I’ve tried to even them out with Photoshop, but rest assured, absolutely nothing else has been done to the photos. Given that Steve has a very demanding job that requires a lot of travel, we didn’t see a lot of him after the first veneers were done. Then he moved out-of-state and we obviously didn’t see him at all for many years. Imagine my surprise, when I got a text message on a Friday evening in August that 1 front veneer had broken and another had a crack in it! Fortunately, Steve still did business in Charlotte and was on his way here when it occurred. The tricky part? He was leaving for a big vacation in just a week. So the only thing to do was to see him on a Saturday morning to fix him up. As it happened, a 3rd veneer had a crack, too. After some discussion, we decided to re-do those 3 veneers for now, and we’d consider whether or not to redo the 4th front tooth if it didn’t match just right. So why did Steve have 3 cracked veneers? A simple but powerful reason: bruxism associated with sleep apnea. Steve was diagnosed with sleep apnea a few years ago and had started wearing a snore guard that doubled as a nightguard. But once porcelain is stressed, it can’t ever be unstressed, so the years of bruxism before the snore guard took their toll and eventually the porcelain cracked. Also, his lower front teeth were already worn and uneven, which also put stress on the porcelain. Veneers on the lower teeth would be an option to reduce that risk, but they’re not enough of an issue for Steve to do. This is why we always recommend a nightguard to protect your investment in cosmetic dentistry! Just as with most things, they rarely fail all at the same time. It’s usually 1-2 at a time. This means you can replace them as needed. Steve chose to redo all of his veneers because he wanted all of them even brighter than the first set. If the rest of the veneers are ok, there is no need to redo all of them. Don’t forget: as long as you have teeth, you can get cavities. Brush, floss, and see your dentistry regularly! If you’re investing $15-40,000 in your smile, wear a nightguard. It’s the cheapest and most effective insurance available. Hopefully this article has provided answers to many or all of your questions about porcelain veneers, their durability, what happens when they need replacing, why they often need replacement, and how to care for them so they’ll last as long as possible. I do have other patients with veneers that we did 15-16 years ago that are still going strong and not in need or replacement yet; I’m looking forward to seeing how much longer they last!